It’s that time of year, when the publicity for the Alba Real Ale Festival starts cranking up and as an established customer of ours, we are helping the organisers get their promotional material ready. Thanks to the website and the efforts of the team involved, the festival is in the enviable position of selling out for one of their three days already, so I’m changing the ad before it’s even run in the Broughty Ferry Spotlight mag. 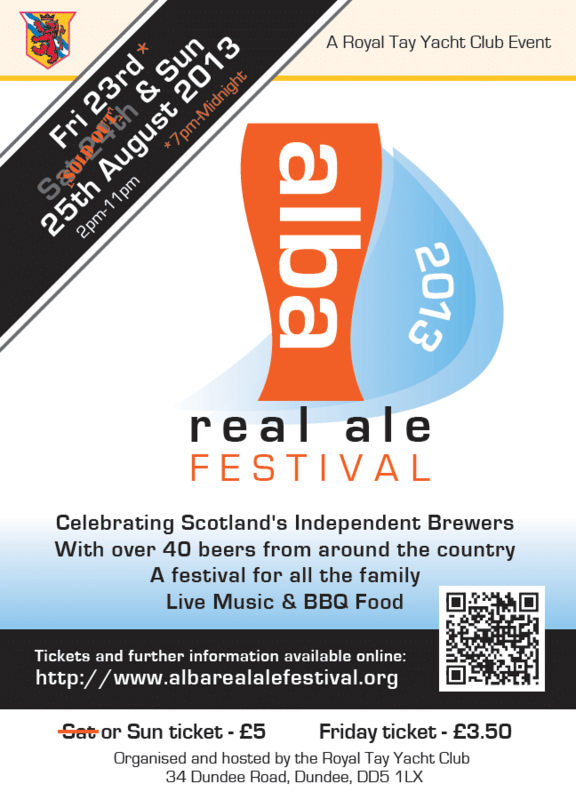 The Alba Festival Ad appearing in a number of magazines. One of the interesting things about switching between print and web design is that the higher resolution of print means that you can make text and and design so much smaller when targeting print and things are still legible. A couple of good examples in the festival ad are the lion motif in the top right and the “sold out” text. Both would end up looking mangled on a non-retina computer monitor, but are easy enough to make out when printed on paper. If you are based in or around Dundee and have any graphic design requirements – ads, business cards, letterheads, brochures or posters – we are happy to offer our services. Of course, it goes without saying that should you require website development or design to go along with the graphic design work, we are only too happy to help.